Roussinos D. & Jimoyiannis A. (2013). Analysis of students’ participation patterns and learning presence in a wiki-based project. Educational Media International, 50(4). Jimoyiannis A., Tsiotakis P., Roussinos D. & Siorenta A. (2013). Preparing teachers to integrate Web 2.0 in school practice: Toward a framework for Pedagogy 2.0, Australasian Journal of Educational Technology, 29(2), 248-267. Jimoyiannis A., Tsiotakis P. & Roussinos D. (2013). Social network analysis of students’ participation and presence in a community of educational blogging, Interactive Technology and Smart Education, 10(1), 15-30. Jimoyiannis A. (2012). Developing a pedagogical framework for the design and the implementation of e-portfolios in educational practice. Themes in Science & Technology Education, 5(1/2), 107-132. Angelaina S. & Jimoyiannis A. (2012). Analysing students’ engagement and learning presence in an educational blog community. Educational Media International, 49(3), 183-200. Atsoglou K. & Jimoyiannis A. (2012). Teachers’ decisions to use ICT in classroom practice: An investigation based on Decomposed Theory of Planned Behavior. International Journal of Digital Literacy and Digital Competence, 3(2), 20-37. Jimoyiannis A. & Angelaina S. (2012).Towards an analysis framework for investigating students’ engagement and learning in educational blogs. Journal of Computer Assisted Learning, 28(3), 222-234. Jimoyiannis A. (2011). Using SOLO taxonomy to explore students’ mental models of the programming variable and the assignment statement. Themes in Science and Technology Education, 4(2), 53-74. Roussinos D. & Jimoyiannis A. (2011). Blended collaborative learning through a wiki-based project: A case study on students’ perceptions. International Journal of Digital Literacy and Digital Competence, 2(3), 15-30. Jimoyiannis A. & Gravani M. (2011). Exploring adult digital literacy using learners’ and educators’ perceptions and experiences: the case of the Second Chance Schools in Greece. Educational Technology & Society, 14(1), 217–227. Jimoyiannis A. (2010). Designing and implementing an integrated Technological Pedagogical Science Knowledge framework for science teacher’s professional development. Computers & Education, 55(3), 1259-1269. Jimoyiannis A. & Gravani M. (2010). Digital literacy in a lifelong learning programme for adults: Educators’ experiences and perceptions on teaching practices. International Journal of Digital Literacy and Digital Competence, 1(1), 40-60. Stansfield M. H., Connolly T. M., Cartelli A., Jimoyiannis A., Magalhães H. & Maillet K. (2009). Developing a framework for best practices in sustainable virtual campuses. International Journal of Networking and Virtual Organisations, 6(5), 440-459. Cartelli A., Stansfield M. H., Connolly T. M., Jimoyiannis A., Magalhães H. & Maillet K. (2008). Towards the development of a new model for best practice and knowledge construction in Virtual Campuses. Journal of Information Technology Education, 7, 121-134. Siorenta A. & Jimoyiannis A. (2008). Physics instruction in secondary schools: an investigation of teachers’ beliefs towards physics laboratory and ICT. Research in Science & Technological Education, 26(2), 185-202. Jimoyiannis A. & Komis V. (2007). Examining teachers’ beliefs about ICT in education: implications of a teacher preparation programme, Teacher Development, 11(2), 181-204. Jimoyiannis A. & Komis V. (2006). Exploring secondary education teachers’ attitudes and beliefs towards ICT adoption in education, THEMES in Education, 7(2), 181-204. Jimoyiannis A. (editor). Research on e-Learning and ICT in Education. New York: Springer (2011). ISBN 978-1-4614-1082-9, e-ISBN 978-1-4614-1083-6. Angelaina S. & Jimoyiannis A. (2011). Educational blogging: Developing and investigating a students’ community of inquiry. In A. Jimoyiannis (ed. ), Research on e-Learning and ICT in Education (pp. 167-180). New York: Springer. Jimoyiannis A., Gravani M. & Karagiorgi Y. (2011). Teacher professional development through Virtual Campuses: Conceptions of a ‘new’ model. In H. Yang & S. Yuen (eds. ), Handbook of Research on Practices and Outcomes in Virtual Worlds and Environment (pp. 327-347), Hershey, PA: IGI Global. Jimoyiannis A. (2008). Factors determining teachers’ beliefs and perceptions of ICT in education. Ιn A. Cartelli & M. Palma (eds. ), Encyclopedia of Information Communication Technology, 321-334, Hershey, PA: IGI Global. Jimoyiannis A. (2008). Computer simulations and scientific knowledge construction. Ιn A. Cartelli & M. Palma (eds. ), Encyclopedia of Information Communication Technology, 106-120, Hershey, PA: IGI Global. Jimoyiannis A., Tsiotakis P. & Roussinos D. (2011). Pedagogical and instructional design issues towards the integration of Web 2.0 tools in instruction: Implications of teachers’ training pilot courses in Greece, In A. Abraham, E. Corchado, S.-Y. Han, W. Guo, J. Corchado, A. Vasilakos (eds. ), Proceedings of the 7th International Conference on Next Generation Web Services Practices (pp. 530-535), Salamanca, Spain, IEEE. Jimoyiannis A. (2010). Developing a Technological Pedagogical Content Knowledge framework for science education: Implications of a teacher trainers’ preparation program, Proceedings of the Informing Science & IT Education Conference, InSITE 2010 (pp. 597-607), Cassino, Italy. Gravani, M. N. & Jimoyiannis, A. (2009). Factors shaping the profile of the ICT adult educator: implications from a social inclusion programme in Greece. In Papastamatis, A., Valkanos, E., Zarifis, G. K., Panitsidou, E. (Eds. ), Educating the adult educator: Quality provision and assessment in Europe, ESREA Network on Adult Educators, Trainers and their Professional Development, E-book conference proceedings (pp. 837-844), Thessaloniki, ISBN: 978-960-243-668-4. Stansfield M. H., Connolly T., Cartelli A., Jimoyiannis A., Magalhães H. & Maillet K. (2008), The development of models for identifying and promoting best practice in e-learning and Virtual Campuses, in D. Remenyi (Ed. ), Proceedings of the 7th European Conference on e-Learning (pp. 520-529), 6-7 November 2008, Agia Napa, Cyprus. Jimoyiannis A., Stansfield M., Connolly T., Cartelli A., Magalhães H., Maillet K. & Koulaidis V. (2008), Virtual Campuses: A new paradigm in e-learning widening access to higher education. In C. Angeli & N. Valanides (eds. ), Proceedings of the 6th Panhellenic Conference with International Participation ‘’Information and Communication Technologies in Education’’ (Vol. II, pp. 419-426), Cyprus. Vrachnos E., Jimoyiannis A. (2008), DAVE: A Dynamic Algorithm Visualization Environment for novice learners. 8th IEEE International Conference on Advanced Learning Technologies (pp. 319-323), 1-5 July, Santander, Spain. Cartelli, A., Maillet, K., Stansfield, M. H., Connolly, T. M., Jimoyiannis, A., Magalhães, H. and Toland, J. (2008), Identifying and promoting best practice in Virtual Campuses and e-Learning. ED-MEDIA 2008 Conference (pp. 897-902), 30 June - 4 July, Vienna, Austria (Outstanding paper award). Cartelli A., Stansfield M., Connolly T., Jimoyiannis A., Magalhães H. and Maillet K. (2008), Towards the development of a new model for best practice and knowledge construction in Virtual Campuses, Proceedings of the Informing Science and IT Education Conference (InSITE 2008) (pp. 22-25), June, Varna, Bulgaria. Jimoyiannis A. and Komis V. (2006), Factors affecting teachers’ views and perceptions of ICT in education. In P. Isaias, M. McPherson & F. Banister (eds. ), Proceedings of the IADIS International Conference e-Society 2006, (Vol. I, pp. 136-143), Dublin, Ireland. 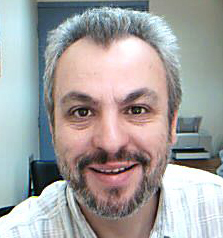 2011 - to date: Coordinator of the Computer Science and Technology Group, Project "DIGITAL SCHOOL: Specifying a Digital Educational Platform, Building and Operating an Educational Knowledge Base, Adapting and Annotating Learning Objects with Educational Metadata, Building the Infrastructure to Support Exemplary Teaching Practices and the Use of the Participatory Web", Greek National Strategic Reference Framework (NSRF), Νο 296441 (2010-2015), Computer Technology Institute and Press "Diophantus". Co-founder and co-editor of the peer-reviewed academic journal Themes in Science and Technology Education. Member of the Editorial Review Board in various international peer-reviewed journals and conferences in the areas of e-learning and ICT in education.